Quote: "The motto of the mongoose family is: run and find out"
Much like the Holiday-themed specials A Charlie Brown Christmas and Rudolph the Red-Nosed Reindeer, the 1975 animated made-for-TV film Rikki-Tikki-Tavi was an annual tradition in my house. 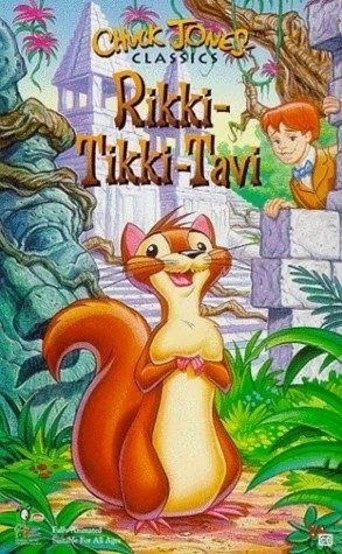 Based on Rudyard Kipling’s short story, Rikki-Tikki-Tavi had it all: laughs, excitement, danger, and two of the most sinister villains ever to grace a children’s cartoon. After being washed out of his burrow by a raging storm, the mongoose Rikki (voiced by Shepard Menken) takes up residence with a colonial British family, patrolling their vast garden and protecting them from the dangerous creatures that inhabit it. His most lethal foes are the cobras Nag (Orson Welles, who also narrates) and Nagaina (June Foray), who intend to kill Rikki’s new masters so that they can move into the house, where they’ll have plenty of room to raise their growing family. Aided by Darzee the Tailorbird (Lennie Weinrib) and his wife (Foray), as well as the cowardly muskrat Chuchundra (Welles again), Rikki tracks down the deadly cobras, intent on killing the pair before they can carry out their diabolical plan. Written and directed by Chuck Jones, who a decade earlier brought Dr. Seuss’s How the Grinch Stole Christmas to life, Rikki-Tikki-Tavi starts out innocently enough, with Rikki, soaking wet and worn out by the storm, being discovered in the garden by young Teddy (Michael LeClair) and his father (Les Tremayne), who proceed to dry him off and give him something to eat. There’s humor in these early scenes as Rikki, trying to get acquainted with his new surroundings, sprints through the house and the outdoor garden, amazed by the beauty of it all. The story takes a dark turn, however, when Rikki meets up with Nag, who the night before devoured one of Darzee’s young chicks. Cowering at first when Nag spreads his hood and moves forward, Rikki soon finds his courage and begins chattering back, narrowly escaping death when Nagaina tries to sneak up behind him. For me, Nagaina was always the more threatening of the two cobras, and a late scene, where she’s about to strike Teddy’s leg as he sits at the breakfast table, is the most frightening moment in the entire picture. We root for Rikki throughout the movie, yet at the same time realize he’s facing a pair of very formidable foes. As intense as it is beautiful, Rikki-Tikki-Tavi is a spirited retelling of Kipling’s classic tale, and despite its darker elements is a movie your kids are sure to enjoy.